Iorio enters his first season with Long Island and fifth in professional baseball. Cuas returns for a second season with the Flock and fifth in professional baseball. The right-hander has spent all four seasons of his pro career in the Frontier League. 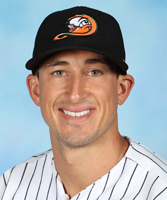 He turned in a career-year during the 2018 season with the River City Rascals, accruing a 1.46 ERA over 45 appearances, a total that ranked second in the league. The 27-year-old went 5-1, recorded three saves, and struck out 55 batters while walking only seven in 49.1 innings of work. He was selected to play in the Frontier League All-Star Game and pitched a scoreless inning during the game. The Florida native also made seven appearances with River City during the 2017 season. Prior to that, he combined to pitch in 22 games during the 2015 and 2016 seasons with the Southern Illinois Miners and 12 games in 2015 with the Washington Wild Things. Overall, the Barry University (Fla.) and University of North Florida alum has made 86 career appearances, totaling a 6-2 record, a 3.95 ERA, three saves, and 108 strikeouts to 33 walks over 95.2 innings of work.